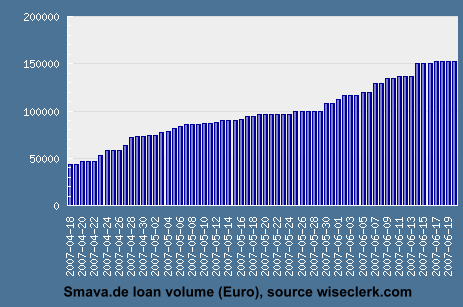 It's been roughly 3 month since the launch of German p2p lending service Smava.de and I want to do a short résumé on the results so far. One huge achievement is that all borrowers made their first payment on time – no lates so far. While it certainly is to early for conclusions, since only one payment cycle (first repayment in the beginning of June) has taken place, the outlook for Smava concerning low default rates is very good. Looks like Smava will be much nearer to Zopa then to Prosper in this point. Smava has a very restrictive approach for admitting borrowers and loan applications. Not only does Smava verify identity, credit score and income documentation – it goes one step further and calculates if the borrower's financial situation is well enough to allow repayment of the desired loan sum. Only after completions of all these checks is the borrower allowed to publish is loan listing. As a result the majority of borrowers (about 70 to 80 percent of all applicants) are declined from using Smava. While this strict validation is good for quality it does slow the growth of Smava. Smava has yet to find a good concept for groups. While there are groups their purpose is yet to be defined. Consequently the majority of borrowers did not bother to join a group. I will continue post updates on the development of Smava here on P2P-Banking.com.